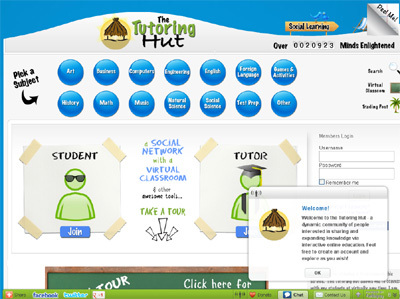 The Tutoring Hut is an interactive online education network connecting teachers, tutors, and students and providing them with state-of-the-art education tools. By 2019 it is estimated that 50% of classes taught will be delivered online. The Tutoring Hut aims to connect those who wish to share their knowledge with those who wish to expand theirs, and to provide their members with a convenient way to sell or utilize educational services. The Tutoring Hut is visionary in the sense that they have penetrated the vastly growing eLearning market. The website is also a completely free community and functions on a social networking platform, exposing users to basic features we are all comfortable with (profiles, groups, direct messaging, etc.). When you create an account, you are joining a community comprised of thousands of students, tutors, and teachers, all looking to virtually connect with one another. Each member has a unique profile and is easily searchable. Besides providing a meeting ground for those interested or involved in education, the site serves as a portal where knowledge can be interchanged. A Virtual Classroom is a unique online interactive education option provided to all members. The room serves as an integral part of the learning process, allowing users to see, hear, and interact with each other while presenting material from any Microsoft Office type document. Located in the main menu of the website, Virtual Classrooms are extremely simple to create and join. It is a perfect solution for 1-on-1 tutoring sessions, study groups, or an entire class! As a student member of the Tutoring Hut community, you have access to an entire network of people waiting to share what they know with you! Whether your goal is to raise your grades by getting help in certain classes or if you need immediate assistance in any area – you are bound to find someone on the site that can answer your questions immediately. By becoming a member of the Tutoring Hut you can also benefit from your strengths by connecting with someone in the network who wants to improve his or her skills in that area. By becoming a tutor on the site, you are in essence, creating your own business. For the first time, you will have the opportunity to connect with your students from anywhere and at absolutely any moment! Visit http://www.TutoringHut.com today and learn more about the startup company hoping to conquer online education!